I feel like candy is inspiring crafting and art everywhere I turn these days! A fantastic amalgam of two of my favorite things! 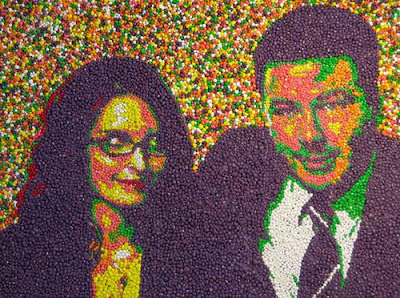 This portrait by Andrew Salomone depicts 30 Rock actors Tina Fey and Alec Baldwin in a rainbow of Nerds candy and was originally published by whatthecool blog. If you'd like to try your own candy portraiture, Make:Projects provides a handy article on how to preserve your candy art for posterity. Now go craft something tasty and beautiful of your own!